As a NAPA Auto Care Center, every summer we participate in a campaign to raise funds for the Intrepid Fallen Heroes Fund. We're inviting our customers and the public to participate in this campaign! The Intrepid Fallen Heroes Fund is a non-profit organization that provides support to United States military personnel wounded in service to our nation, and their families. Organized in 2000, the Fund was established as an independent not-for-profit organization in 2003. Since its inception, the Fund has provided almost $150 million in support for families of U.S. military personnel lost in service or severely wounded and veterans. The Fund relies solely on public donations with 100% of contributions applied directly to Fund projects. Nothing is deducted for administrative expenses. You can help support the wounded and their families by purchasing a Battery, Alternator or Starter that is part of this campaign during July and August (specific products that have $25 rebate Visa cards for your purchase). 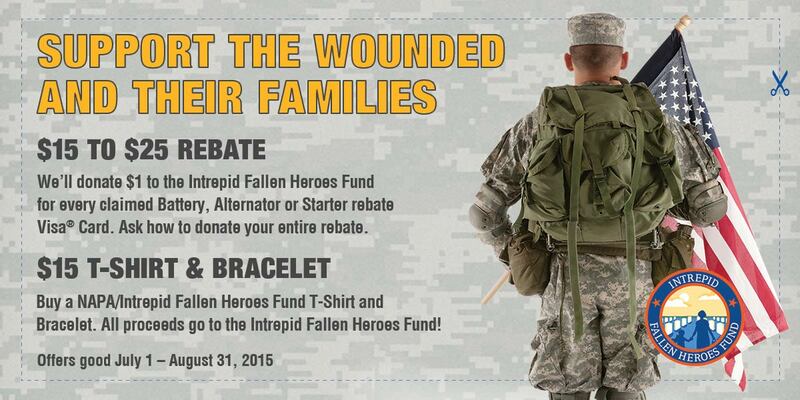 We'll donate $1 for every $25 Visa Rebate Gift Card Claimed (ask how you can donate the entire rebate) and/or for $15 you can purchase a NAPA/Intrepid Fallen Heroes T-Shirt and Bracelet with all proceeds going to the Intrepid Fallen Heroes Fund. Family Support (2000 – 2005) - The Fund provided close to $20 million to families of U.S. and British military personnel lost in performance of their duties. The Center for the Intrepid (January 2007) - To serve military personnel catastrophically wounded in operations in Iraq and Afghanistan, a $55 million state-of-the-art physical rehabilitation center was opened at Brooke Army Medical Center in San Antonio, Texas. National Intrepid Center of Excellence or NICoE (June 2010) - A 72,000-square-foot facility for the treatment of traumatic brain injury (TBI) and post-traumatic stress (PTS) was opened at Walter Reed National Military Medical Center in Bethesda, Maryland. NICoE Satellite Centers (Current Project) - Efforts are now focused on the design and construction of multiple centers which will enable military personnel to receive state-of-the-art treatment for TBI and PTS in connection with the main NICoE Center in Maryland. Two centers are now open and two more are under construction; funds are needed to build up to five additional centers.